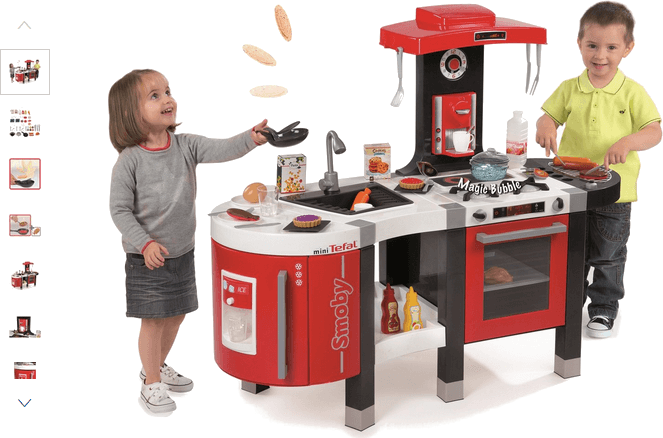 The Smoby Tefal French Touch Kitchen is sure to stimulate the creative juices of little ones. Jam packed with accessories and goodies, your most cherished will be spoiled for choice. The Tefal French Touch Kitchen comes compete with life-like cooking sounds from the hob and a frying pan capable of clipping pancakes. That's not all; this Kitchen includes a stove with two (2) hotplates, grill, removable sink, extractor hood, clock, oven, coffee machine and a massive array of forty-five (45) cooking/play food accessories - food has a cooked side and raw side, one for prior to cooking and one side for after! It's these little touches that really sets this Kitchen apart; the refrigerator even has an ice cube dispensing machine capable of cooling beverages at the push of a button. There are certainly enough features to keep kids fully entertained and engrossed in their culinary world for hours. Get money off with April 2019 free Argos voucher codes, see if there's a promo code for the Smoby Tefal French Touch Kitchen product. Argos may be out of stock of this product. To enhance your shopping experience you may also be redirected to a search results page when you click an outbound link.